There is still a scar above Felipe Massa’s left eye but it is hard to see under the peak of his cap – even up close. The light, red patch on his forehead is a mark left from surgery to insert a metal plate and is not from the crash itself. 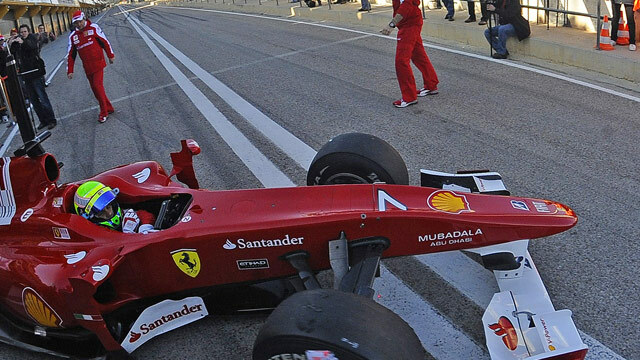 Massa enjoys testing the new Ferrari F1 car at Valencia. If Massa's grid opponents are looking for signs of vulnerability, an indication the Brazilian has not recovered from last July’s horrific accident in Hungary quite as well as he claims, they will be sorely disappointed. Prior to his first test drive of Ferrari’s new car for the 2010 Formula One season, it was hard to ignore the fierce determination that bubbled beneath his affable exterior as he spoke confidently and intelligently during interview. Members of the Ferrari camp say Massa has changed from this time last year. He is more quiet and focused, leaving his new teammate Fernando Alonso to be the excitable one, jumping around the garage. However, Massa’s circumspection should not be mistaken for timidity. In his first drive of Ferrari’s F10, he was faster than any of the Formula One drivers on the opening day of testing in Valencia. Formula One's biggest comeback maybe that of the legendary Michael Schumacher, but Massa's return is odds-on to have more impact on who will be crowned world champion. Massa certainly has the support needed to be successful if the scene in Valencia is anything to go by. Engineers buzzed around the garage, where everything is organized to maximize efficiency and, ultimately, the speed of the car. Formula One has always been thought of as motorsport’s pinnacle, and despite the controversy and acrimony of last season, not mention the financially challenging times we live in, the sheer size and cost of the F1 "circus" is something to behold at close quarters. For example, each team possesses at least half a dozen articulated lorries – designed to transport mechanics, engineers and support staff around the world during the course of a season. Like something from a Transporters movie, they then transform into semi-permanent buildings at each venue. Testing in Valencia has whet the appetite for the start of the new season and while rights-holder Bernie Ecclestone is undoubtedly the ringleader, Massa will hope to be the main draw this season. GO MASSA!!!! I hope to goodness its you and not Alonso that ends up on top.